Power Consumption 10 VA. Max. Fluid Temperature 150 F. Flow Rate 1 GPM. Fittings 1/2" Sweat. 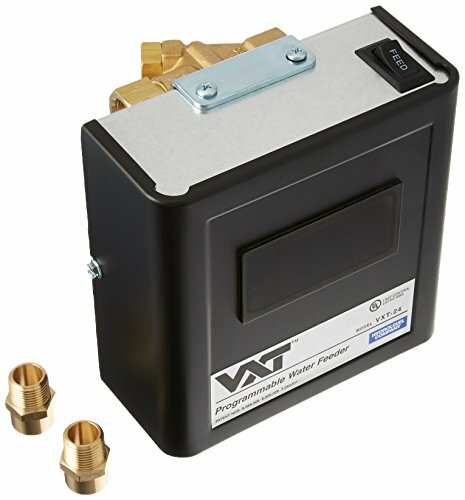 Upon a feed signal from low water cut-off, the VXT feeder delays (from 30 seconds to 10 minutes) to allow condensate to return to boiler. If make-upwater is required after the delay period, the VXT will initiate a feed cycle. TheVXT can be set to feed to the level of the low water cut-off or can be set from 1 to 5 gallons to raise the water level above the cut-off to the normal operating level. The digital feed counter tracks all water fed into the boiler including water added using the Manual Feed Button. VXT-24. 24 VAC. This Polished Chrome 10 kW generator is perfect for adjusted cubic footages of 251 to 450 cu ft. CHOOSE THE RIGHT SIZE GENERATOR: Choosing the right Steam Shower Generator size is very important. First - measure the normal cubic footage of your shower stall. Next you'll need to adjust this for certain steam shower stall features such as materials, exterior walls, and ceiling height. Materials: For natural stone or marble, multiply by 2.0. For ceramic or porcelain tile, or glass block, multiply by 1.35. Exterior wall: For one, multiply by 1.1; for two, multiply by 1.2. Ceiling height: For a 9 ft. ceiling, multiply by 1.15; for a 10 ft. ceiling, multiply by 1.3. Steamist is proud to present our Elite Steam Steam Shower Generator line of products. The experts at Steamist have leveraged their 60 years of experience to create a steam shower package that is both easy to buy and built for years of dependable operation. Made in the USA, Elite Steam provides the industry's most popular features and high-quality steam - all delivered in a streamlined buying process and reduced price point. Our robust warranty will provide peace of mind for years to come. 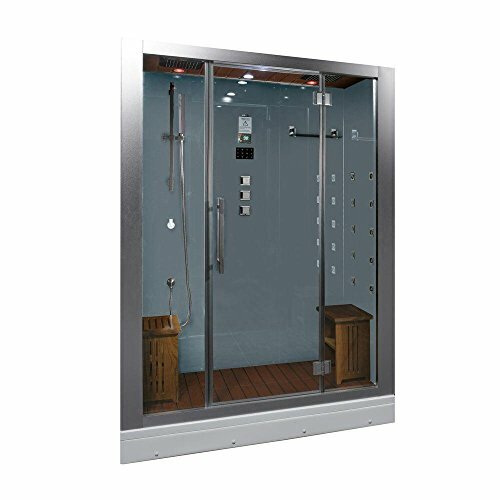 Elite Steam Steam Shower Generators are built to last utilizing years of Steamist experience, highly reliable components, and a stainless steel tank. Our steam shower packages have everything you need to get your steam shower up and running in no time. 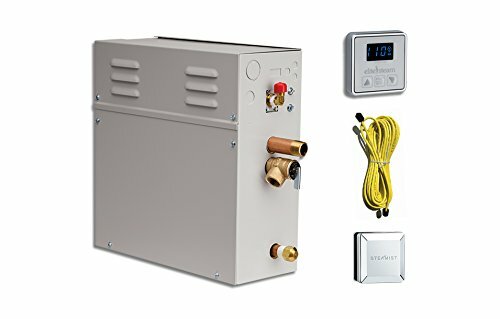 The compact and sleek design means you can install the steam generator almost anywhere like under a cabinet, in a wall, or in a nearby closet. The interior control comes in three stylish and classic finishes: polished chrome, brushed nickel, or polished nickel. It features custom temperature and timing settings. 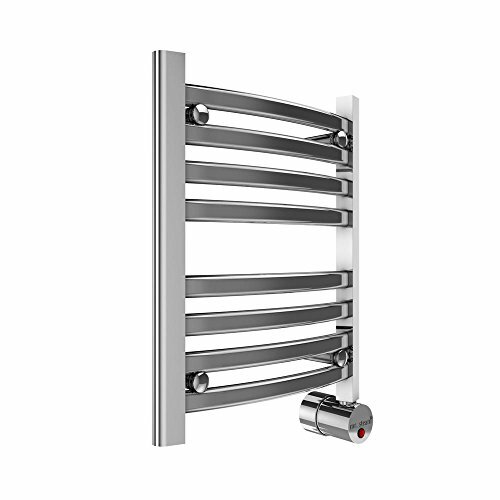 If you're looking for dependable steam with all the essential functions then look no further. 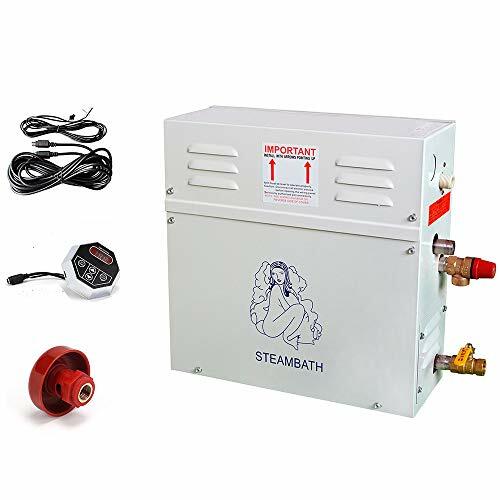 Reliable Quality Steam - Our Steam Shower Generator is manufactured by Steamist, one of the Most Respected Manufacturers in the Steam Shower Industry. We use Stainless Steel Tanks and Quality Components for Years of High Quality Steam in your Bathroom. Simple to purchase and install - Our Steam Shower Bundles have everything you need so it's super simple to buy. We include the steam generator, the inside control (in polished chrome, brushed chrome, or polished nickel), the steamhead, and the cable. Fits into almost any space - Our Steam Shower Generators are Tight and Compact and Can Fit in Almost Any Space even Under Counters or in Nearby Closets. 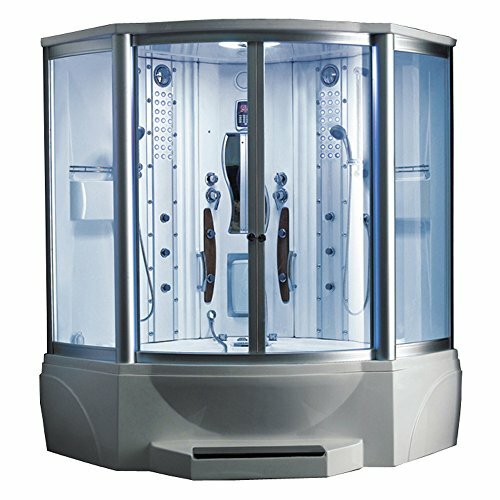 Best in Class warranty - We warranty that our Residential Steam Bath Generators, Controls and Accessories are free from defects in materials and workmanship for a period of one (1) year. After one (1) year the residential steam generator will have an extended limited ten (10) year warranty on parts only. The Thermasol SET-AB is a signature series traditional digital controller black nickel. This controller features an adjustable temperature control, and has 2 memory settings for customization. It is compatible with both Pro and AF series generators, and features an all-metal construction for long-lasting durability. It also comes with a day clock for convenience. 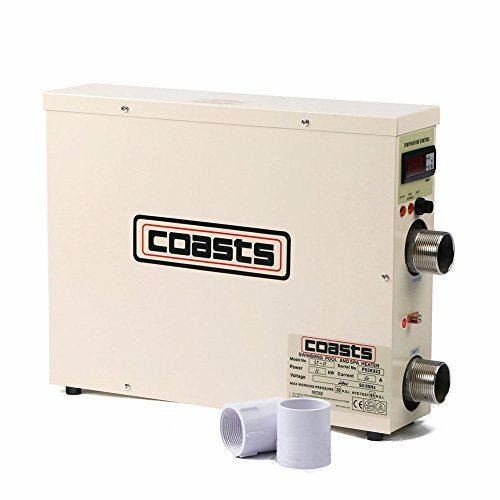 This 12 kW generator is perfect for adjusted cubic footages of 451-550 cu ft.
Steamist is proud to present our EliteSteam Steam Shower Generator line of products. The experts at Steamist have leveraged their 60 years of experience to create a steam shower package that is both easy to buy and built for years of dependable operation. Made in the USA, EliteSteam provides the industry's most popular features and high-quality steam - all delivered in a streamlined buying process and reduced price point. Our robust warranty will provide peace of mind for years to come. 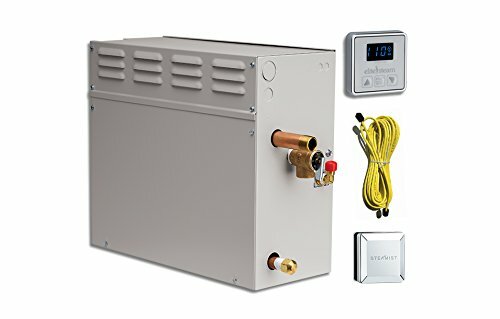 EliteSteam Steam Shower Generators are built to last utilizing years of Steamist experience, highly reliable components, and a stainless steel tank. Our steam shower packages have everything you need to get your steam shower up and running in no time. 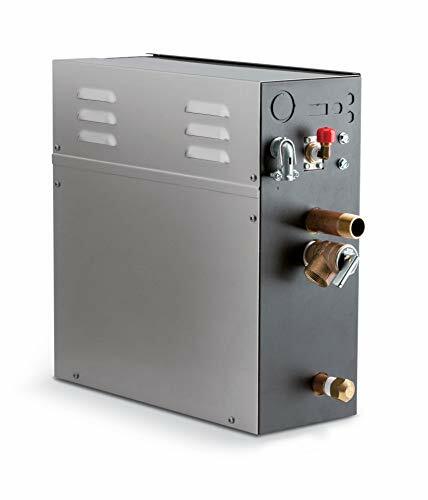 The compact and sleek design means you can install the steam generator almost anywhere like under a cabinet, in a wall, or in a nearby closet. The interior control comes in three stylish and classic finishes: polished chrome, brushed nickel, or polished nickel. It features custom temperature and timing settings. If you're looking for dependable steam with all the essential functions then look no further. Made in the USA by Steamist, see sizing information in description below. This big, beautiful, rectangular shaped & free-standing unit is a beauty that is packed with features. 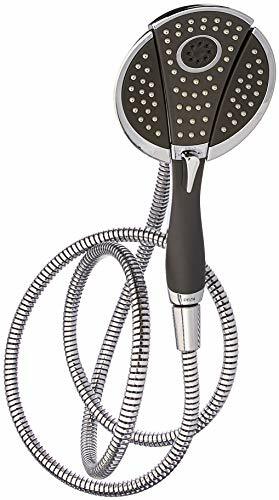 Huge monsoon rain shower head, hand-held shower, pulsating back jets, tantalizing foot massager, comfortable headrest & of course the powerful 3KW steam generator. This shower also has a convenient two tier glass shelf and a modern touch screen control panel to manage all the showers wonderful features. Allthis in one sleek looking shower that offers a ton of bells & whistles. Dimensions: (length x Wideth x Hight) 3.9"x3.9"x1.6"
-It pass the ISO9001 quality certification and CE approved. -Ozone sterilization function; digital timer and water temp control. -Ventilation fan for better air and safe, remote control, safe protection function. -Reasonable design, stable function, use the international advanced technology. 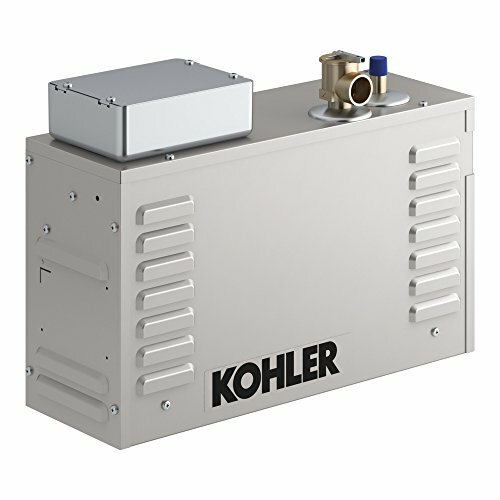 -The steam generator can be equipped with an optional auto drain to enhance performance. 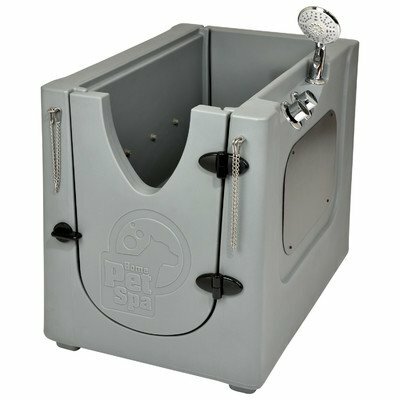 -Can be used frequently because of the stainless steel water box, electronic control panel and safety press button. 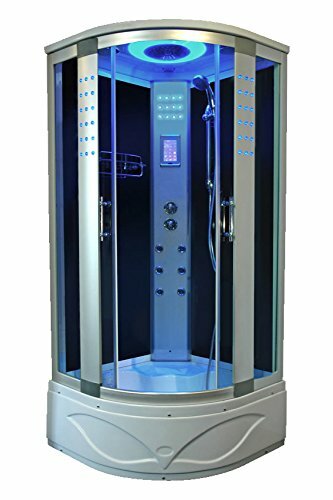 -It equips with special room body to form the complete set of sauna, which can relax people's muscle, eliminate fatigue, and excrete the toxin in the body. 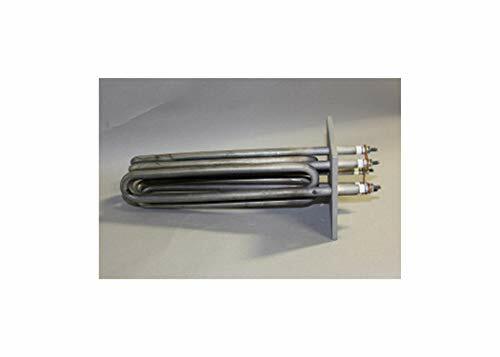 1.Water inlet pipe - the metal pipe is introduced with the existing 15mm pipe, with a 15mm mental hose separate connected to the inlet port of the machine and the valve of the water supply pipe. 2.Steam outlet pipe -steam pipe should use a copper tube whose diameter is not less than 15mm , the steam pipe length is not more than 3 meters, and if the steam pipe length is over 3 meters, it should make heat preservation treatment . 3.Drain pipe - to prevent damage to the body of the house during drainage, a water pipe that is not less than 15mm should be connected to direct drain off water. Relax Your Muscle, Eliminate Fatigue, and Excrete the Toxin In the Body It's Suitable for No More Then 10 Cubic Meter. Wire Connection :First you need to connect two N in parallel with a short line, then you need to connect two L in parallel with a short line, last you need 2 lines connect one L port and one N port to your outside electric supply. Note:The temperature sensor must be installed outside the steam room. This Brushed Nickel 10 kW generator is perfect for adjusted cubic footages of 251 to 450 cu ft. 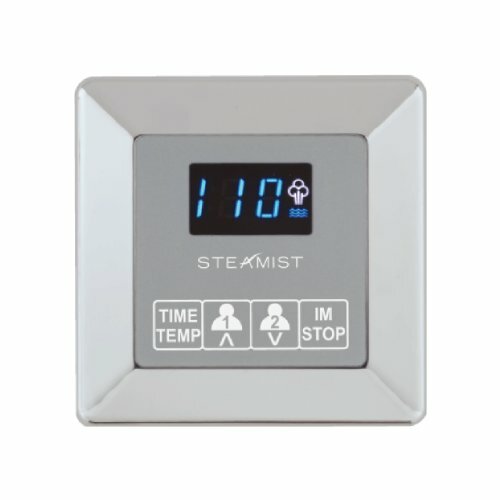 Steam bath control with patented dual temperature sensor for fast accurate temperature response. Installs inside the steam room. Use only with a Steamist TSG series steam generator or the SM Plus (SMP) Series steam generator. This control features two user programable time and temperature cylcles. This control is not compatible with Steamist Steam Spa accessories. RA060 Features: -Hooks up to any faucet in a house. -Entry and exit doors. -6 Mist jets for total soaking. -Shower wand with on/off controls. -Jets and shower wand can be used simultaneously. -Pet safety restraints. Product Type: -Shower enclosure. Country of Manufacture: -United States. Finish: -Grey. Material: -Plastic. Number of Items Included: -2. Dimensions: -Weight capacity: 481.87 lbs. Overall Height - Top to Bottom: -29.25". Overall Width - Side to Side: -24.7". Overall Depth - Front to Back: -35". Overall Product Weight: -60 lbs. Made from durable composite material. Hooks up to any faucet in a house. Jets and shower wand can be used simultaneously. Entry and exit doors. 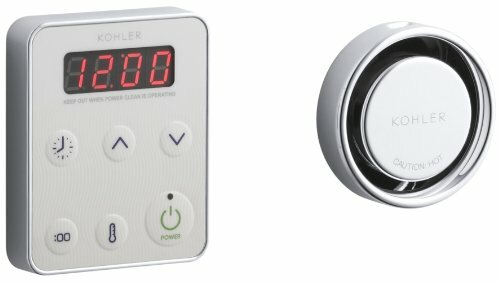 6 Mist Jets for total soaking and Shower wand with on/off controls. Dimensions: 35 x 24.7 x 29.25H, Net Weight: 60 lbs / 27 kg. Easy Connection to any Faucet in the House. 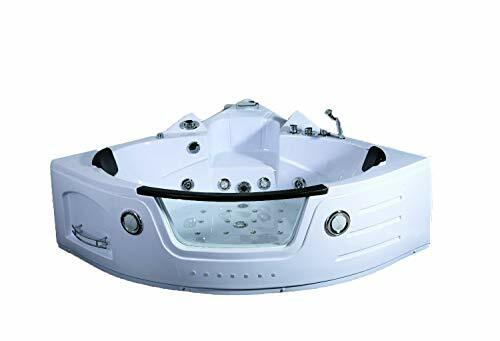 This 2 Person Indoor White Whirlpool/Hot Tub Bathtub will add a modern look to any bathroom. It comes with the Heat Pump already installed. These are fully equipped with Massage Jets, Air Jets, Waterfall Faucet, FREE Heat Pump, LCD Control System (with Remote Control), Hand Held Shower Wand, FM Radio, RCA/CD/MP3 Player Input, 1 Speaker, 2 Soft Padded Waterproof Headrests, Thermostatic Faucet (with Ozone Water Cleaner), and 1 LED Chromatherapy Underwater Light. Water Level Sensor also included. Leveling legs are on bottom of tub to ensure it sits perfectly level. This is a great investment for any home. These will ship BRAND NEW in a sealed factory crate. Materials: Acrylic and ABS compound material with 3 layers of glass fiber reinforcement and a stainless steel frame. Standard delivery is curbside delivery via Freight Courier. Please read our Amazon storefront info and shipping policies, as it may not be possible for us to ship this item to your location. WITH BLUETOOTH! Includes: Water Jet Pump (1 HP, 750W), 4 Adjustable Massage, 12 Back Jets, 13 Air Jets (250W pump). Thermostatic Faucet, 1 Underwater LED Light, FM Radio, RCA Input, 1 Speaker, 2 Padded Headrests. Power: 110v and 30 Amp, Dimensions: 67 from the corner out to the window, 26 High (Overall) 22 High (From the bottom to Top of the Window), 3 Year Warranty on tub structure, 1 year everything else (Parts only). Ships LTL Freight with curbside delivery via lift gate only. NOTE: Inline water heater will only help maintain the water temperature in the tub. It will not heat cold water. 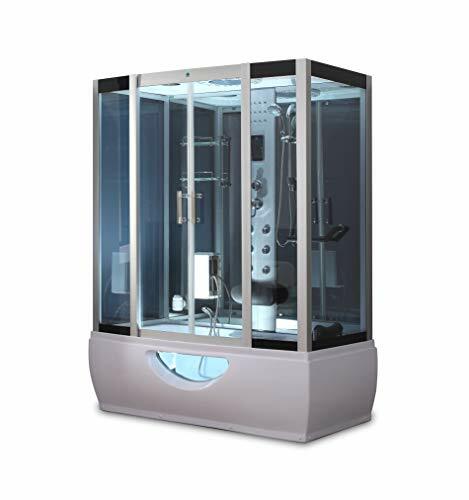 Ariel Platinum DZ972-1F8-W Steam Shower in White 59" x 32" x 87.4"
Shower while listening to music from the FM radio, infuse calming scents with the aromatherapy system and allow the 20 acupressure massage jets to create a therapeutic experience in this steam shower. This is a two person unit and comes with two removable wooden stools. Have the ultimate showering experience at your fingertips without the expensive upgrades a custom steam shower would require. This big, beautiful, free-standing unit is a beauty that is packed with features. 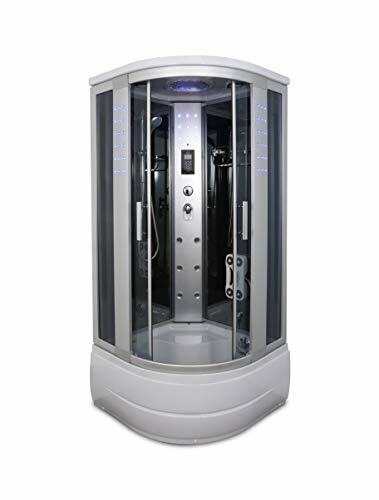 Huge monsoon rain shower head, a hand-held shower and riser, pulsating back jets, a tantalizing foot massager, comfortable headrest and of course the powerful 3kw steam generator. All those features in one sleek looking shower that offers a ton of bells and whistles. This beautiful free-standing unit is a beauty that is packed with features. Huge monsoon rain shower head, a hand-held shower and riser, pulsating back jets, a tantalizing foot massager and comfortable headrest for your ultimate comfort. All those features in one sleek looking shower that offers a ton of bells and whistles. Transform your shower into a private spa and enjoy all the therapeutic and relaxing benefits of steam with Steam Planet's "all in one" Steam Generator Package. Soothe your tired muscles, hydrate your skin, enhance and improve your breathing, help with weight loss and achieve a more restful sleep. Steam Planet steam generators come with everything you need for your own personal spa. Included: Steam generator box, control panel, steam outlet with aromatherapy reservoir built-in. 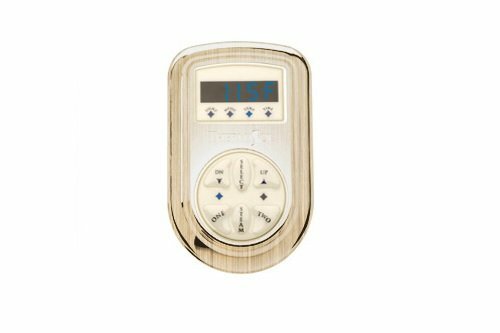 Dual Keypad offers flexibility for user to operate inside and outside the steam room/shower Light Kits available in White or Chromotherapy Stainless steel Drip Pan with Drain - 20x10x1; Weight 3 lbs. This Brushed Nickel 7.5 kW generator is perfect for adjusted cubic footages of up to 250 cu ft. Fits in almost any space - Our Steam Shower Generators are Tight and Compact and Can Fit in Almost Any Space even Under Counters or in Nearby Closets. Model Number: 8004-A Base - 36" x 36" x 16-1/2" x Enclosure Height - 82-3/4"
Faucets, bath accessories are copper material. Chrome plated trim & handles. Direct drain connection to 1-1/2" tubular plastic. Material: ABS board toughened glass(5mm) Toughened glass(5mm) Aluminum alloy Everything inside is water-proof. The shower room is close, won't water leakage. We install plastic belt (water proof) around the shower room to prevent from the water leakage, no silicon used for seal. Faucets, bath accessories are copper material. chrome plated trim & handles. 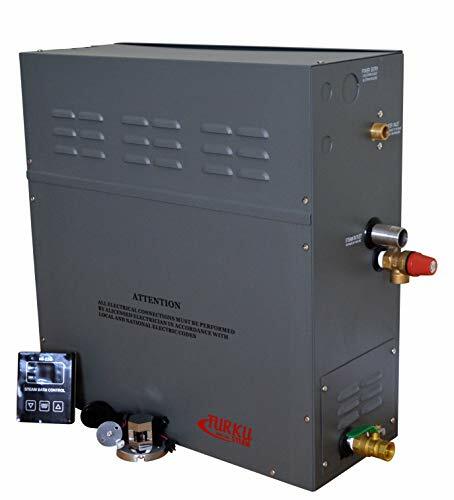 This premium 10 kW steam generator is perfect for adjusted cubic footages of 251 to 450 cu ft.
Steamist is proud to present our TotalSense Generator line of products. Made in the USA, The TSG steam generator includes the premium feature of proportional control SteadySteam and Instamist for faster starts. It will work with one of the following controls: 250, the 450, or the 550. Our robust warranty will provide peace of mind for years to come. Steamist Generators are built to last utilizing years of experience, highly reliable components, and a stainless steel tank. The compact and sleek design means it will take up very little space when installed in a nearby closet or basement. K-1647-PC-CP Finish: Polished Chrome Features: -Fast-Response steam generator control kit.-Easy-to-install digital control panel.-20-minute safety shut-off.-Quick connect RJ-12 cord and connector.-Mounting arms and gasket.-Adjustable temperature settings.-Adjustable session settings.-Digital clock.-Thermostatic steam head with aromatherapy reservoir.-Controls Power Clean feature. Options: -Available in several finishes. The Ariel WS-608A Steam Shower with Whirlpool bathtub is a noteworthy combination of steam shower and Whirlpool bathtub. 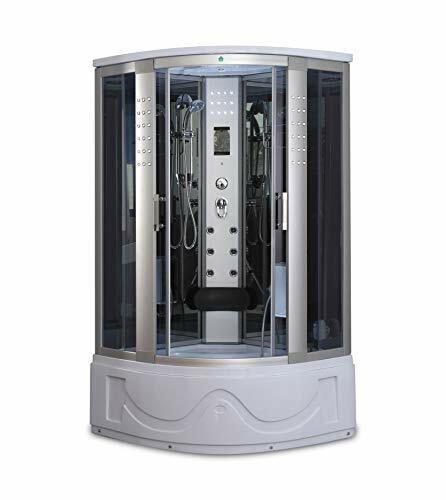 The Ariel WS-608A is a large 2 person unit with 2 built-in seats, a built-in step and 2 handheld showerheads. The unit comes with storage shelves, a decorative light surrounding the showerhead, a dual-layer rack and 10 hydro-massage jets. In addition to Chroma therapy lighting capability and a 3kW generator, this shower and bathtub combination includes a foot massager. 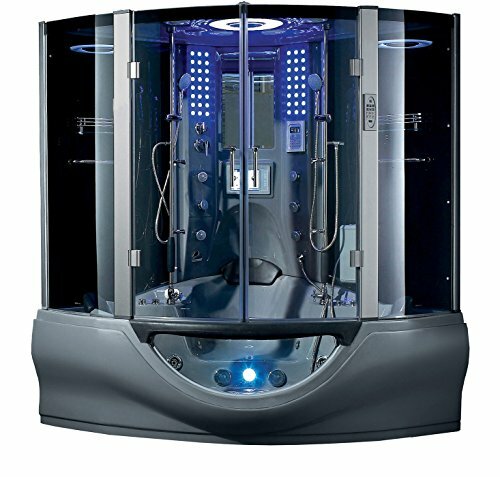 The Ariel SS-608A will completely transform showering as you know it; install one in your bathroom today and enjoy the luxury of steam, the health benefits of acupressure BodyMassage and the soothing effects of Chroma therapy lighting by yourself or in the company of your partner. ATTENTION: ONLY VAPOR-PROOF CONTROL PAD CAN BE SAFELY INSTALLED INSIDE OR OUTSIDE THE STEAM ROOM WHERE IS EASY TO OPERATE. // *STEAM GENERATOR SIZING 1) Measure length, width & height in feet of the steam/shower or tub/shower: Multiply the Length _____ x Width _____ x Height _____ = Room Volume 2) Adjustments to Room Volume: For Ceramic Tile thin set, acrylic or fiberglass +0% For Ceramic Tile mortar bed or cement board backing +20% For Cast iron tub +20% For Each glass block wall or exterior wall (if freezing is possible) +10% For Natural stones (Marble, granite, slate) +100% 3) Add all figures above to obtain the Total Room Volume required = Total Adjusted Room Volume. // AUTO FUNCTIONS: AUTO FILLING: electromagnetic inlet valve will open automatically once the system is started and fill in with water automatically until the water level reaches the maximum level. If the water level is still lower than the minimum required level 10 minutes after the start, it indicates faults of the water supply system, so all heating elements will turn off automatically. AUTO HEATING BY SECTIONS: generator will compare the measured room temperature with the setting temperature and then decides the number of working heating elements. AUTO WATER SUPPLEMENTING: if the water level is lower than the required level during operation, auto water supplementing function will be ON and will open the inlet valve. Once the water level reaches the required level, auto water supplementing function turns OFF automatically. If water level is lower than the required level 3 minute after the water supplementing order is given, it indicates faults of the water supply system, all heating elements will turn off. 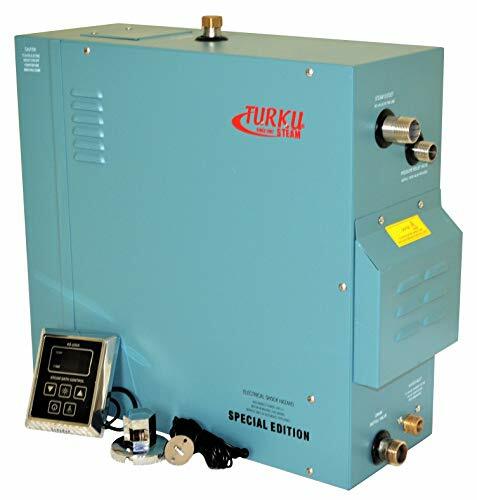 TK120-KS120 STEAM GENERATOR SET INCLUDES: - RESIDENTIAL 12KW 240V TURKU STEAM GENERATOR WITH - VAPOR-PROOF DIGITAL KS-120 CONTROL PAD; - STEAM HEAD; - SAFETY PRESSURE RELIEF VALVE; - THERMOSTAT; MANUAL DRAIN VALVE- CONTROLLER & THERMOSTAT CONNECTION WIRES; - INSTALLATION AND OPERATION GUIDE. Note: 1.The heater is forbidden to use the heat of any other purposes. 2.This appliance is not intended for use by person (including children) with reduced physical, sensory or mental capabilities, or lack of experience and knowledge, unless they have been given supervision or instruction concerning use of the appliance by a person responsible for their safety. 3.Children should be supervised to ensure that they do not play with the appliance. 4.The sauna stove must be used with sauna stone. 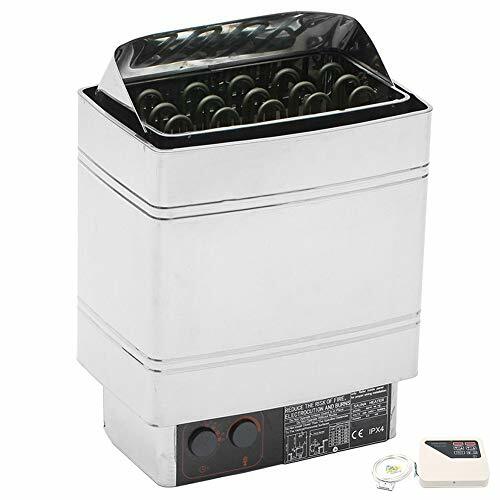 Our sauna heater is designed for small sauna room,which is equipped with suitable sauna room and control the temperature.This item with an elegant new-generation outer control panel, Then you can control the functions of your sauna stove easily. It allows you to control practically anything that can be electronically controlled: operating time, temperature & lighting.With our new sauna stove, you can easily improve the temperature you wanted and gain an amazing sauna experience anytime anywhere. RX120i-KS100A STEAM GENERATOR SET INCLUDES: - RESIDENTIAL SPECIAL EDITION 12KW 240V TURKU STEAM GENERATOR WITH BUILT-IN AUTO DRAIN (!) 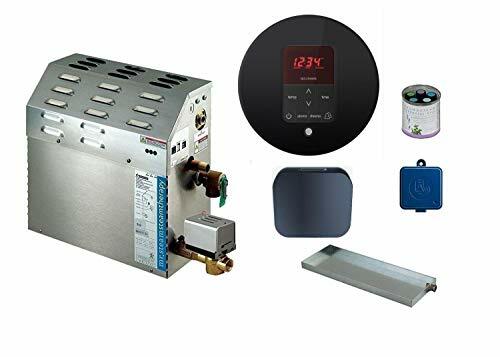 VALVE; - VAPOR-PROOF DIGITAL KS-100A CONTROL PAD; - STEAM HEAD; - SAFETY PRESSURE RELIEF VALVE; - THERMOSTAT; - CONTROLLER & THERMOSTAT CONNECTION WIRES; - INSTALLATION AND OPERATION GUIDE.